Over Christmas & New year I have been a little under the weather – The usual winter cold. So while I was feeling Sorry for myself I browsed the internet for bargains and new products I wanted to try. 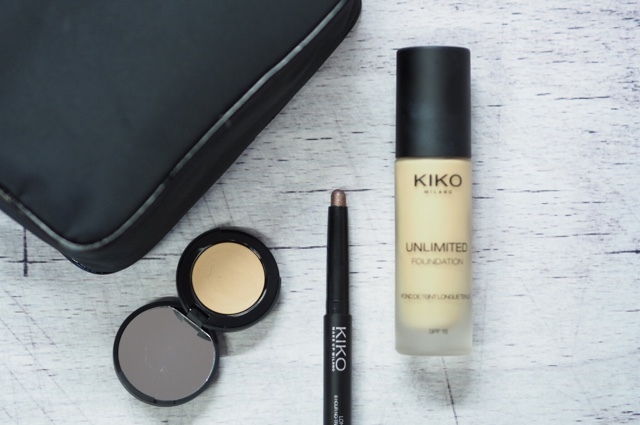 Kiko have just opened a store in Meadowhall which I was planning on going too over the Christmas break but never made it so I placed a small order online. I opted to try 5 different products so I could get a general feel for the brand. First of all my favorite product was the Pochette Medium Make Up Case (£2.90) – I love the size of it to keep in my handbag, I keep a mixture of beauty & other trinkets in there (Comment below if you would like a whats in my bag post) Its quite small with it fits absolutely loads into it and stops all my bits and bobs flying around my bag. The Long Lasting Stick Eyeshadow in 05 Rosy Brown (£3.40) is a gorgeous product, its one for the people wjo are always in a rush. I just apply it to the outer section of my lids and use a finger or blending brush to soften out and then using the stick add a little to the bottom lash line too. very quick, very pigmented and easy to blend – Perfect! They have 30+ shades so you have plenty to choose from. I also wanted to try out one of the Smart lipsticks in the shade Mauve Pink (£3.90) Love the colour but unfortunately there is just too much gold sparkle in the product for me. If they made this without the shimmer it would be perfect. The formula is really nice though, It is quite pigmented and feels comfortable one the lips so I might go into the shop to try a few other shades out. Base wise I bought the Unlimited Foundation in Warm Beige 30 (£14.90) The texture is quite thick, however it is fairly easy to work into the skin using my Sigma 3DHD Kabuki brush. The matte coverage is pretty good covering blemishes and uneven skin tone with little need for concealer. I really like the packaging of the foundation, Its a slim frosted glass bottle with a pump dispensing a good amount of product for the face. I bought this online which I would not recommend as I have bought a shade that is slightly too warm for me, I really could do with trying a shade lighter. I am going to try this out more and do another review because at the moment I like it but it Don’t love it. Last but not least is the Full Coverage Concealer in 02 Natural (£7.50) A solid concealer in a cute little round case with a little mirror (Perfect for handbags) This is not an under eye concealer, it is a full cover product for blemishes, redness, scars etc. Its really good for blemishes, I apply to the blemish then leave it for a minute or two then pat into the area. "5 WAYS I LIKE TO SWITCH OFF AND RELAX"